RS3 gold is the main currency of RuneScape 3. Used to purchase armor, weapons, runes, and ammunition, having a surplus of RS3 gold can help you acquire the rare items that you want from the Grand Exchange. However, grinding for hours upon hours tends to diminish the fun of the game. Instead of experiencing quests or even socializing with friends, players are forced to do mundane repetitive tasks to build up the RS3 gold horde they need for the armor sets they desire. We love RS3, but we don't like the grind. We started Rsgoldund to help players like you get the gear they want, so you can focus on in-game goals. Settling for bad gear or low skill levels is a thing of the past with our low RS3 Gold prices. The process of buying RS3 gold with Rsgoldfund is incredibly simple. Select the amount of RS3 gold you want to buy, add it to the cart, and checkout with one of our secure payment methods. 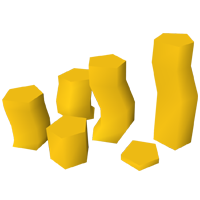 With our low order minimums, you can buy RS3 gold in whatever quantity that is right for your budget. Buy RS3 gold with us once, and you'll be blown away by our customer service, attention to detail, and most importantly, low RS3 gold prices. Have you ever bought something online, only to find the price somewhere better? We absolutely hate it when that happens. That's why we have a price match guarantee to make sure that you're getting cheap RS3 gold with the peace of mind that our secure service offers. If you find RS3 gold cheap from other sites, open a chat window with us and provide proof. We can provide you bonus RS3 gold to match the prices of our competitors. RS3 gold should never be too expensive with our cheap RS3 gold price matching! Do you have RS3 Gold for sale? We're always looking to expand our available inventory of RS3 gold. Contact one of our customer service representatives today to get the most for your RS3 gold for sale with our service. Just like buying RS3 gold, the process of listing your RS3 gold for sale is simple, secure, and comes with industry leading customer support with Rsgoldfund.